These days, AMC is synonymous with some of the most popular original programming around. Mad Men. Breaking Bad. The Walking Dead. For those of us who knew AMC back when it was still American Movie Classics, we’ve watched the network’s rise and fall and rise and fall and rise with an initial swell of shock, shock, horror, horror … then surprise … then reconciliation … and now a genuine buried-hatchet admiration. And yet even in the old AMC days of Bob Dorian and Film Preservation Festivals, there were glimmers of the network’s future as an original programming stalwart. In fact, it was during the years of AMC’s pre-TCM dominance in classic film that it first branched out into the original programming arena. AMC’s debut original series was a refreshingly original and unabashedly nostalgic bit of programming that consistently hit the “ahhhh, that’s nice” spot. The show was a complete anomaly from day one. Premiering in 1996, the same year that American TV sets were faithfully tuned in to ER, Friends, Everybody Loves Raymond and Law & Order (the latter of which people still do), a show like Remember WENN was an oddity. Writer Rupert Holmes had crafted a period dramedy set at a Pittsburgh radio station during WWII with no modern considerations: No laugh track. No big names. No established audience. 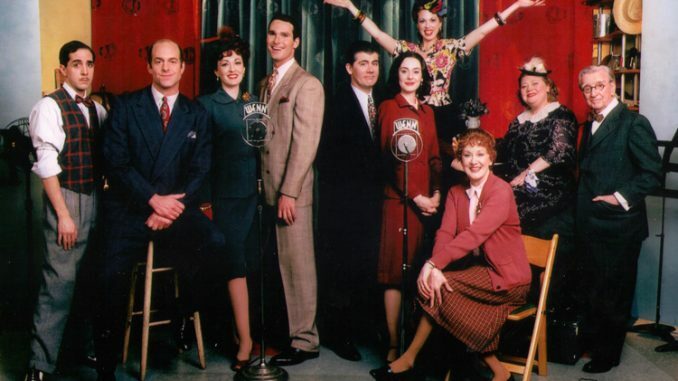 The show-runners gave us Mr. Foley, a convincingly Keatonesque sound guy; the sweet-faced writer Betty Roberts (think of her as a Peggy Olson 1.0) ; the cuddly-wuddly Mackie Bloom, Mr. “man of a thousand voices”; the handsome, silky-voiced Jeff Singer, WENN’s romantic leading man; and several more darling characters that –as stereotypical as it was– were nevertheless thoroughly irresistible. But more importantly, the show’s hijinks were always balanced by the gravity of the era– for all the witty frivolity, sobering subplots involved air raids, rationing, and war injuries. Surprise guest stars were also a constant on the show, with the likes of Jason Alexander, Eddie Bracken, Molly Ringwald, John Ratzenberger, Roddy McDowall, and, yes, Mickey Rooney, among others. The show was a big gamble for AMC, but the station’s faithful viewers–and we were reverently faithful during that period–tuned in loyally each week. In those days, the Internet was a relatively new and somewhat exclusive phenomena, hardly the global village it is today, and therefore AMC did not benefit from the close-knit community that its modern day counterpart, Turner Classic Movies, enjoys today. We were there, we simply had no means of connectivity. Perhaps if Remember WENN had been borne under more liberal architecture, its lifespan would have lasted a bit longer. It was not to be. One year after Metzler’s interview, the show was canceled at the end of it’s fourth season– not coincidentally in 1998, the same year that AMC came under new management … and things were never quite the same again. A number of Remember WENN episodes are currently available for viewing on YouTube. Watch the pilot episode below.